I was at my Fairy Blog Mother’s almost until midnight when our sewing machine’s turned back into pumpkins. Yall! Her slips look so good! Wait until you see them. I’ll show you when she’s completed the room! She used off-white cotton canvas for both her sofa and love seat and sewed the piping with a contrasting amy butler fabric. She’s going to cover her round ottoman with the same amy butler fabric! It is to die for! Until then….here are some gals who are also making it happen with their transformed furniture all sassy and slipped! Shayla is a member of The Lazy Girl’s Slipcovers and is rocking it with these cute club chairs and ottoman! Please go look at her before chairs! I’ve been swooning over this periwinkle linen chaise slipcover by Tamerie! 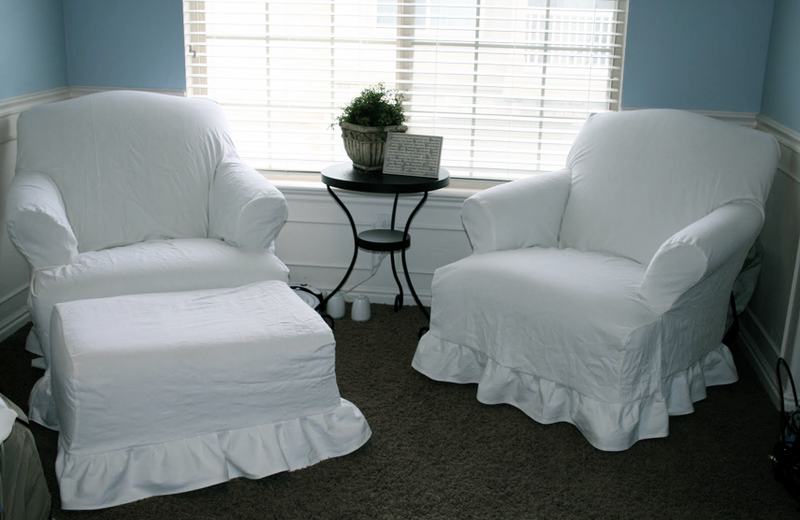 Look at the little ruffle trim she did around the cushions! It is so charming…makes me want to curl up with a glass of wine and watch the entire season of Glee! 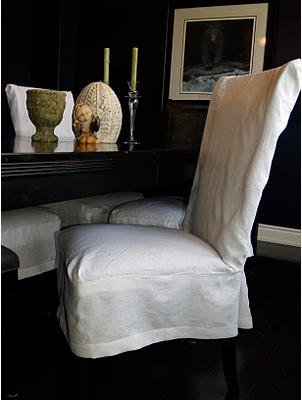 Anne-Marie’s linen dining slipcovers are so simply elegant! Go see this sofa before Cottage and Cabin got a hold of it! It was RED yall! RED! Now it’s as pure as white snow! 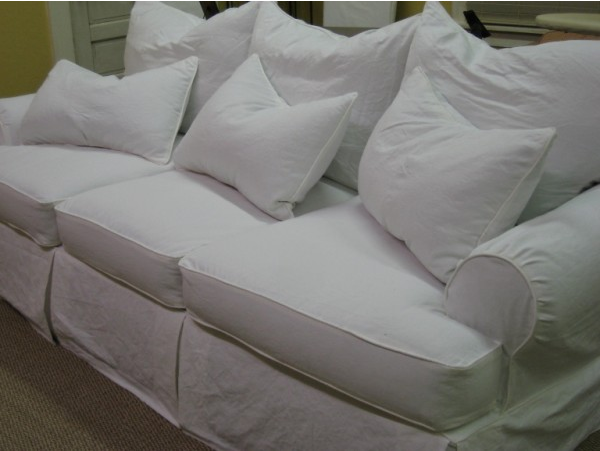 Also, check out this article: ‘Going Green with Slipcovers‘. We live in a disposable society, so when you slipcover old furniture, you’re doing good and going green! Do your part…Slipcover and reduce your carbon footprint! **Grab a Featured button over there to the right if you’ve been featured and link back so everyone can be inspired! BTW: I decided on this Amy Butler fabric to slipcover my sofa! I bought it from Fabric.com and it was on sale! And I can still make a white one to switch it up whenever I feel like it! Yay!! I'm so honored! Thanks for featuring my covers and for the inspiration in the first place! Thanks for including my chaise in your 'Friday's Featured Slipcovers.' I've only been following you for a short time, but am enjoying seeing all the different slipcovers and hearing your stories. I just ordered some trim from Fabric.com today. I love that website. 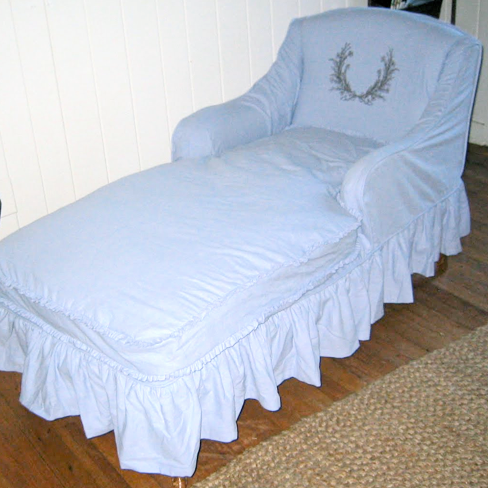 BTW- I just completed a semi-slipcover for a rocking chair today. I was so darn proud of myself I could hardly stand it. Does that mean I am ready for wing back chairs? I ordered that 16 yards from fabric.com as well (5 months ago), but I am so nervous to take the plunge. I just need to do it. Too many parties and events this summer to have ugly wing back chairs. Thanks so much for the inspiration. I love this feature – and I finally started cutting mine out!